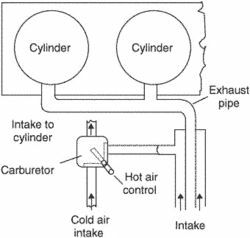 The illustration shows the carburetor heat-control system of an aircraft engine. A sheet metal jacket surrounding part of the engine exhaust system to heat the air going into the carburetor as needed. Air from inside the engine nacelle flowing between the jacket and the exhaust system gets heated and is passed into the carburetor through a carburetor heater valve, provided the carburetor air temperature is low. If not, this hot air is dumped into the atmosphere.